We don't usually see "Stands" with the same ability. How does Jotaro develop a power similar to Dio's in the final battle. And now, everytime he uses his stand, he shouts out "Star platinum the World" as if he adopted Dio's power. What happened in the final fight with Dio? While Star Platinum has a bad habit of pulling new abilities from underneath his loin cloth (I'm looking at you, Star Finger), I don't think it's the case here. I think it was implied that Star Platinum had the Time Stop ability the whole time. When Jotaro confronted Dio, he quickly figured out that their stands were very similar in terms of speed, range, strenght, size and what not. 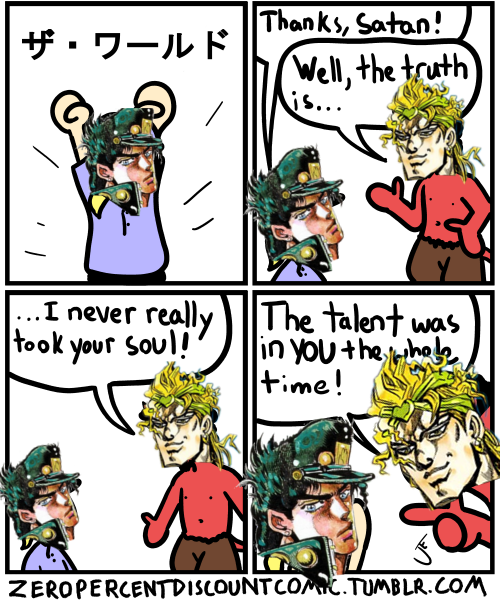 And once Kakyoin figured The World's secret ability, it dawned on Jotaro that Star Platinum might have a similar skill. Of course, he couldn't trigger it easily. At first he was merely able to see glimpses of the stopped time, then he's able to move in it for a moment and only at the very end does he finaly manage to stop time on his own. Not all stand abilities are known to their users instinctually. Even Dio discovered the Time Stop by accident while training. He also had to train his ability to extend its length and his movement in it. While never actually explained, the most likely reason their stands are the same type is their macabre family connection. Jotaro shares a bloodline with the body Dio currenlty posesses (through the world's first vampire to human head transplant).